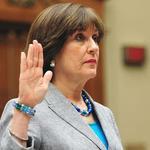 She gets to claim the title of Liar Lois Lerner for her part in the cover-up of the alleged “missing,” e-mails in the belly of the beast serving as a secret vault for wrong-doing to the citizens of these United States of America. Thanks to the Judicial Watch organization and the donations of citizens, their crimes and perjured testimonies have not escaped detection. You can follow the link below to read how Lois and her friends were finally outed as regards the almost missing e-mails. Still, the IRS (DOJ) Attornies won’t look for the e-mails because it is too hard. We guess the final decision on finding the documents will have to wait for a judge’s decisions. Are there any bets on which way a judge will rule?